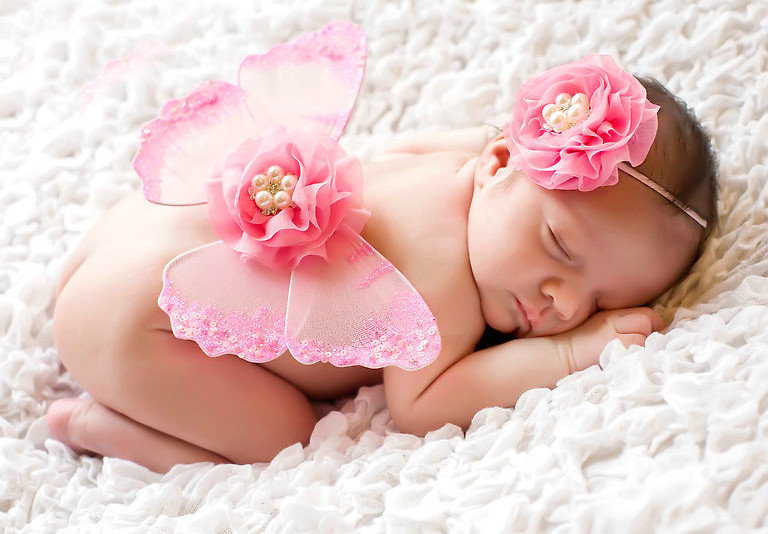 Beautiful and pure, newborn babies are a complete joy to photograph. Most of our subjects sleep right through the shoot, but mom and dad often have a lot of questions. Learn the basics before you schedule your photos with Stefanie Lynn Photography for a sweet and relaxing day with your little one. Newborn photographs are best taken before your baby reaches two weeks of age. The perfect time to capture the bond between mom, dad and baby, photos of your newborn can also be made into custom birth announcements. Instead of waiting until after your little one is born, contact me ahead of time and I will pencil you in! Once your bundle of joy has arrived, we can set a specific date and time. A sleepy baby is a happy baby, so I recommend keeping your infant awake before his or her big debut. Breaks for feeding and changing are expected and welcome – don’t worry if your little one doesn’t nap straight through. Whether wide awake or fast asleep, your child will photograph beautifully. Loosen your baby’s diaper and clothing a half hour or an hour before the shoot to give imprints in the skin time to disappear. Perfect just as they are, infants need nothing but their beautiful skin for our photo shoots. Especially with a naked baby, accidents happen! Bring some extra clothing for everyone, including black shirts for mom and dad. The perfect background to hold your little one, long sleeve shirts let your baby take center stage. Our children grow so fast and they only stay this tiny small for a blink of the eye. Capture your new bundle of joy in this sweet moment so you and your family can remember their tiny fingers and toes for the rest of your lives. Get some inspiration from my newborn gallery and contact Stefanie Lynn Photography at 508-603-1163 to schedule an appointment in the Boston, MA area today.